Description of car for sale : Nissan 2001 Y Primera Manual petrol Silver £2,650 107,000 miles, "Full Main Dealer Service History Air Con, Elec Windows/Mirrors, Hands Free Nokia Kit Etc. Passenger Seats Virtually Unused. 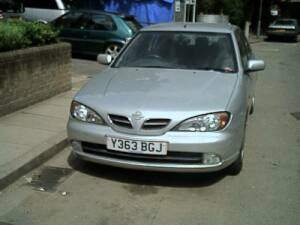 Excellent Condition And Totally Reliable"